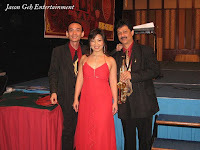 Jason Geh Entertainment provides Wedding Live Bands for weddings in Malaysia. Live band comes package with Sound System and musical instruments. Just proceed to Jason Geh's main live band website for contact information. 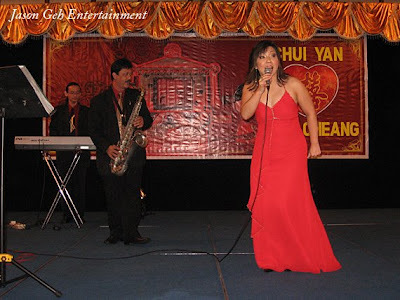 Here are some photos of Jason's live band performance during the wedding of Chui Yan and Beng Cheang on the 31st of August at the Grand Riverview Hotel, Kota Bharu, Kelantan. 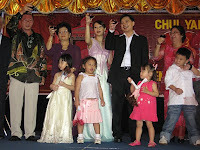 My live band perform lots of chinese favourites and oldies upon request by our gracious host. There were some special guest singers that came up to jam with the jazz trio mid-way through dinner that includes Datin Nellie. 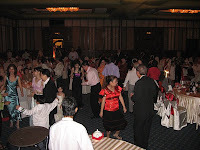 The night was rounded off by a set of dance music from the band for those who love to dance. Band comprise of female vocalist accompanied by keyboard and saxophone player. We arrive early at Kota Bharu by flight on the morning of 31st and did a band sound check. 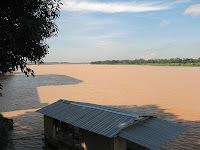 Haven't visited KB for years hence find it quite refreshing to feel the rustic living away from bustling KL. After sound check, it was off to Chui Yan's parents house for some satisfying local treats. Jason, I just found this posting on your blog. My wife and I just read it and I think we never had the chance to give you a proper feedback. First of all, I just wanted to say that you did a fantastic job. It was everything we wanted. The music selection of evergreen hits is the type of music I would listen too at home. Everyone at the wedding thought the band was fantastic. 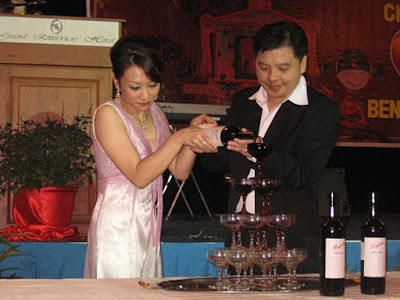 We would like to thank you for doing a good job in making our wedding such a fun and memorable one. That means a lot to me guys... Thank you!